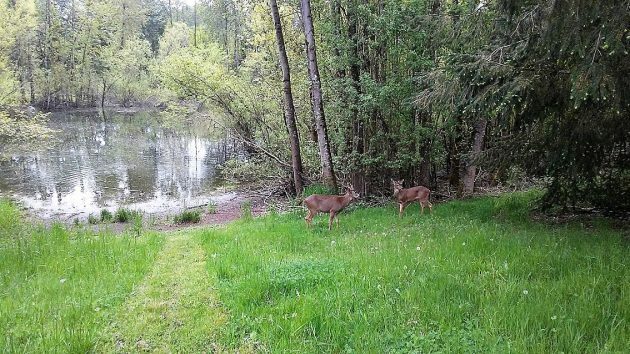 In a photo taken in May, deer graze near the city-owned pond north of Hickory Street N.W. The Albany Parks Department has no use for a little pond the city owns next door to a planned North Albany apartment project and would like to dispose of it. Go ahead and get that process started, the city council said this week. Ed Hodney, director of parks and recreation, brought it up at the council’s work session Monday. The site apparently was excavated as part of the nearby North Pointe development about 20 or so years ago, and the property then was donated to the city as open space. The city’s parcel is surrounded by private property, and there’s no public access to it. Hodney said it’s of no recreational value to his department, and he recommended selling it. The surrounding banks are steep and the pond is a true “wetland,” so it can’t be developed. Benton County says its assessed value is just under $30,000. The neighbors who have been taking care of the meadow down to the pond, Lee and Sue Cutsforth, showed me the place last spring when I was asking about a proposed development in the vicinity. The development, at 321 and 333 Hickory Street, is a 40-unit apartment complex called Sunset Village. The developer is based in Fond du Lac, Wisc. The city planning division approved the site plan on Sept. 6. And on Nov. 6 and 7, the building division approved construction permits for two buildings, one with 22 units and the other with 18. It will be the second apartment complex to go up on Hickory. The other, Hickory Hollow with 48 units, opened this summer west of North Albany Road. Dispose of? Will all the neighbors with room in their yard debris bins please step forward. The deer pictured standing idly by the pond in question are, by City Moms and Pop’s standards, camping illegally. Granted, this is a lifestyle choice on the part of the wild creatures, but their somnolence does not require the City to be on the hook for their felicity. Enough already with the guttersnipe deer. Let them earn their own way through the world, like the rest of us do. A deer’s modus vivendi is not now, nor should it ever be, a burden on Albany taxpayers. Ticket the deer and sell-off the property. Let the Private Sector support these scofflaw critters. Better yet, send the creatures to Benton County where poverty, laziness and slacking-off are considered high culture. North Albany is fast losing any open space it has. A lack of foresight by the planning commission will make this area as congested as possible in the foreseeable future. Good luck walking your dog and riding your bike. Exactly what restrictions would you impose to stop development – assuming they could pass legal…? How about they do something about the traffic first. There needs to be another bridge into North Albany and they need to widen Hwy. 20 for starters. For those who think we who live in N. Albany are just a bunch of complainers, I suggest you check out the traffic at rush hour. It is sad indeed that North Albany, once a Maginot Line delaying the inevitable, is now bypassed by reality. This fact causes much gastrointestinal distress amongst the North Albany exclusivistas. But time waits for no one. Are there any regulations regarding the city (or county) selling open space? This pond sale seems to make sense, but what if they wanted to sell Lexington Park (city) or the open space on the corner of Crocker & Valley View (county)? I can’t speak to county regulations, but for the city, in both cases you suggest, and as happened with the property in Hasso’s article, (regardless of who proposes it), the final decision would have to come to council for approval or denial. Has this pond been designated WETLANDS by DSL (see paragraph 3 above, “A True Wetland” or was it dug out and made into a pond by an earlier developer? If it is truly a “wetland” someone with enough money can, sadly, jump through DSL loops and replace what is filled in by buying a “mitigation” site somewhere else. Who in their right mind would buy this pond if they can’t develop or otherwise use it. As for the above remark about N. Albany deer – I have seen deer feeding on the Linn County Court House lawn in the wee hours of the morning. Are they on the dole from Linn County? Those deer often come into my yard and enjoyed my garden this year. I welcomed them and feel sick that we chase them away more and more. Could the officials designate that pond for our wildlife? I trust that the planners and traffic experts know what they are doing about open spaces and for parking and traffic congestion in the Hickory area. I understand that growth is necessary and believe our city government representatives want to take care of us. Pretend you are neighbors here. Come visit our pond and huge field next door. If only the city could turn the field into a city park. Dreaming…. Check the zoning before moving there. If the zoning changes, challenge it. Otherwise, get over it and don’t waste tax payer money challenging it.